Instant face lift tape has found a strong following of women looking for a cure-all to aging skin. This non-surgical option can instantly give you a mini-face lift, smoothing out wrinkles and fine lines, but there are some cons women should be aware of as well. There are many companies that make instant lifting tapes, each with a similar method of application. Determine which is right for you by checking out their elastic color options and qualities. 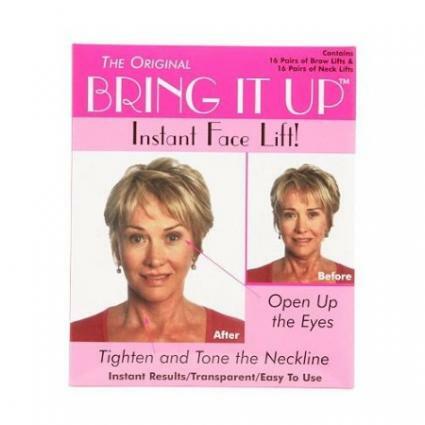 Secret Lift Face Lift Tape by Cosmesearch makes both a face and neck lift tape. The elastic comes in both light and dark shades to help it blend in with a variety of hair colors, as well as three sizes to help you get the fit you want. Starter kits come with all three sizes; order more of the one that fits best. Bring It Up! Instant Face Lift! Bring It Up! instant face and neck lift tape is a more simple solution than the tapes that use elastics. These unobtrusive strips attach at your forehead and neck to lift the skin. A hairstyle that includes bangs is recommended by the company to help hide the appearance of the tape. The product claims that use will also tighten and tone the neckline. 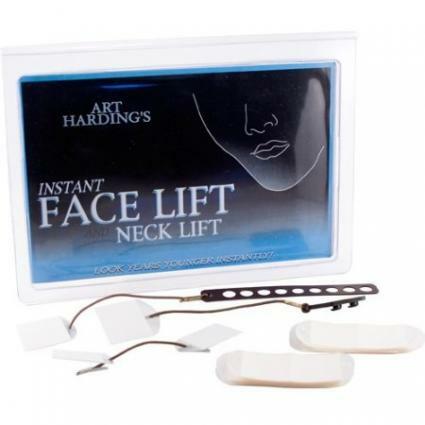 Art Harding's face lift products have been used on television and by celebrities, according to testimonials on the web site. The product uses elastic to secure the tape and comes in dark and light, with a 30 day money back guarantee. This is an inexpensive option from Glamour Boutique that uses only tape to lift and secure specific areas of the face, such as the eyes. It is meant for temporary use, and a wig or head scarf is recommended to help hide the appearance of the tape. This may be a good option for someone just wanting to see what the results would look like, before spending more money on other options. The application of instant face lift tape is quite simple. Many companies include pictorial instructions with the tape to ensure a safe and effective result. Position one end of the elastic string found on the tape on each side of the face by your ears. Lift the strings over your head. Hook them together under your hair with the adjustable strap. This will cause the skin around your cheeks and jaw line to "pull back" and give a more youthful appearance. Stick one end of the tape on the skin with the face relaxed. Pull back on the skin with your free hand, and secure the second end of the tape further up the face or neck. Style the hair over the tape to hid it. The tape can be worn all day long, and many companies sell sets, because the instant face lift can only go through one use. Always practice your instant face lift before going out in public with it. The process can be tricky at first, so make time for a trial run before you show your new look off to the world. While many women swear by the results they get from face lift tape, others find its downsides detract from the benefits. When applied correctly, the tape can make a dramatic change in your appearance. With frequent use, it is possible to become accustomed to the feeling of the tape on the face, and it becomes simply part of the beauty routine. It can be used to help women get an idea of what they will look after surgery and to help make a better decision in this case. The tape can sometimes appear tacky and obvious. Hiding something so complex and large so close to your ears can prove difficult and obviously limits your hairstyle options. The tape is not in any way a permanent solution; once it is removed, the face and neck return to their previous state. While this is beneficial for some women, others may prefer a more permanent solution. Long term costs. While the tape is fairly inexpensive, each piece can only be used once. If you wear it daily, you may find the costs add up quickly. Some women may find it a steep learning curve to apply it correctly. As each face is different, the exact position of the tape may differ, making some faces more challenging to fit than others. If you are looking for a fairly inexpensive and temporary option for eliminating wrinkles and lines on the face and neck, you may want to give face lift tape a try. Consider the pros and cons, and if you are looking for a non-surgical, temporary option, you may decide that it's just the product you need.